Anyway, the poptarts are simple – only 5 ingredients. 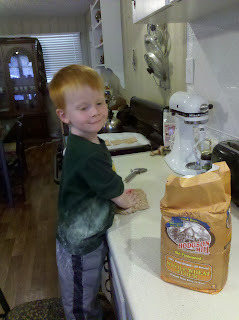 I felt a bit like we were making Christmas cookies, with all the dough rolling. As usual, I have a few modifications/notes. Next time around, I would roll the dough out thinner. Thin is good. I would also use more jelly. Be generous with your jelly. (Do check your jelly and make sure it doesn’t have high fructose corn syrup in it. Then you can feel good about eating your poptarts). I’m going to keep my eyes open for some sort of glaze for the top – hopefully one without too much sugar, so I can continue to feel good about eating poptarts. If you see something with potential, send it my way! Here’s my awesome helper working on his poptarts. « Who loves pumpkin scones? Such an adorable helper!! I'm really excited to try these with some spiced country applesauce I have! If you find a glaze let me know…my dear hubby is willing to try them, but the glaze is really important to him.